I’m not kidding when I say my mom is Proudduck’s biggest follower. She reads every single post and every single comment and then calls me to ask me if I know who Anonymous is. -___- And during meetings, I’d get Mommy popping up on my phone screen to ask me why I haven’t been blogging for 24 hours. Sometimes she even refreshes this blog when I’m next to her. Like hello, I’m right here if you miss me, Mommy! Haha. My mom is too cute, seriously. Geee… I wonder where you got that idea from, Mommyyyy…. The next day, I sent Daniel over to my mom’s while I went to work. When I came back…. Mommy!! I burst out laughing. She really doesn’t waste any time. 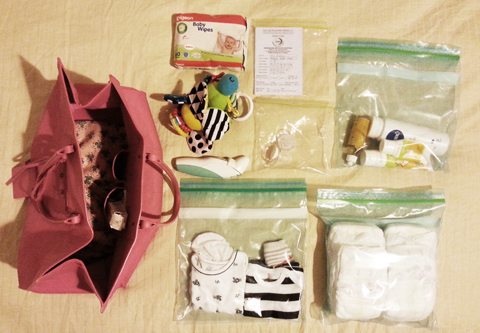 I get the zip locks of the pacifiers, diapers and whatnot…. but what did his hospital book do to deserve quarantine? Hahahahha.baby d’s hospital book also? Actually, im also a ziplock mom! I ziplock a lot too including my son’s hospital & clinic books 🙂 and i have a few spares packed in the bag. Glad to know I am not the only ziplock mummy around. I carry spare biodegradable nappy sack to store soiled diapers etc to save cost. And those hospital liners to line public changing tables! Ziplock bags are excellent in keeping precious hospital record book dry and clean. Just make sure the bag is not punctured from wear and tear. Immunisation record was required for my firstborn entry to play school and was I glad I had mine in mint condition for a clear photocopy/scan! This post is too cute!!! Your mummy is too cute! Lol. Ziplock pun tatau nak beli mana.. Aiyaaaa…Theres alot selling in supermarkets. Or try ikea..
U can buy ziplock at Jusco also. Got Jusca brands and Reynolds….